Use to use Pump-unit in combination with the filtration disposable. Connect the filtration disposable to the Pump-unit, set the pressure to the correct value and add the whole blood sample without pre-processing, lysing or fixation. 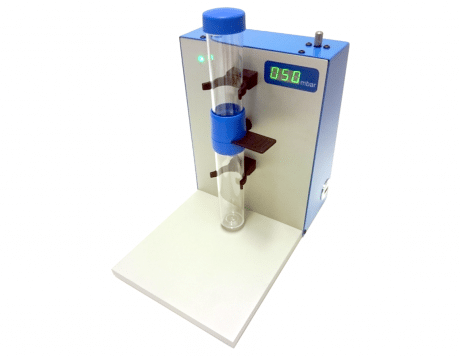 For filtration of CTC a microsieve is used with 160.000 pores with a diameter of 5 micrometer. It creates a negative pressure at the waste side of the disposable. The system has an adjustable pressure from 0 – 250 mbar. There is a display to readout the pressure. It takes around 1 minute to filter a tube of whole blood after which the cells can be labelled. Different collection tubes require a different under pressure. For Transfix tubes 200mbar is advised, for Cell Save 100mbar and for EDTA 30mbar. Labelling the cells takes around 30 minutes after which the slide with the microsieve chip can be imaged. The waste container can take up to 40ml of fluid. This is also the maximum amount of liquid with can be processed at once. Besides whole blood also other body fluids can be filtered.